This IBM® Redbooks® publication will help you design and manage an end-to-end, extended distance connectivity architecture for IBM System z®. This solution addresses your requirements now, and positions you to make effective use of new technologies in the future. Many enterprises implement extended distance connectivity in a silo manner. However, effective extended distance solutions require the involvement of different teams within an organization. Typically there is a network group, a storage group, a systems group, and possibly other teams. 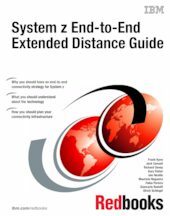 The intent of this publication is to help you design and manage a solution that will provide for all of your System z extended distance needs in the most effective and flexible way possible. This book introduces an approach to help plan, optimize, and maintain all of the moving parts of the solution together.